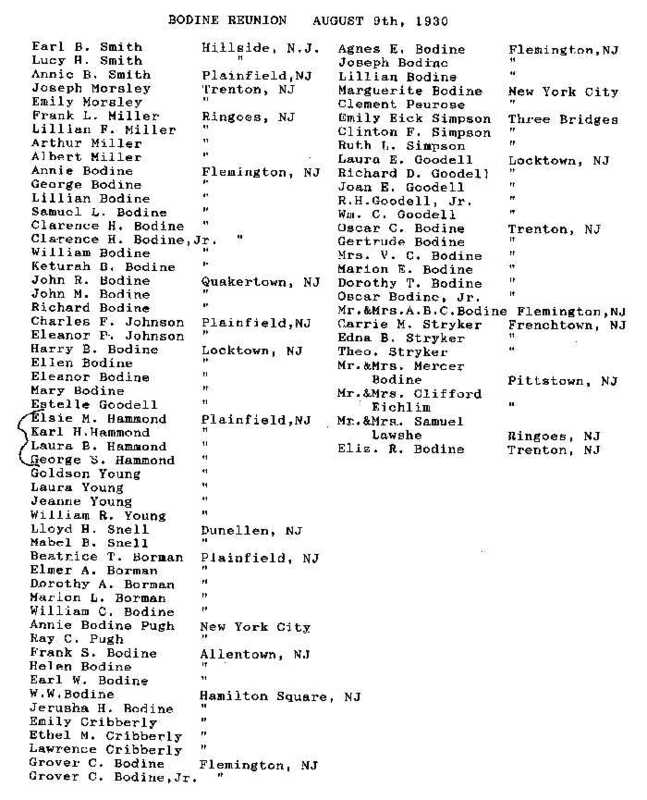 This is a list of people who attended a Bodine reunion held on August 9, 1930 in New Jersey. Dave Anderson's aunt, Dorothy (Borman) Johnson, attended this reunion when she was about nine years old. Dave asked her where it took place. Dotty thought it was held at Butlers Park near Washington, New Jersey. Earlier reunions had been held there or at Locktown Church, possibly in Croaton or a small town called Locktown. Dotty believed that John Bodine lived across from the church. (Dave Anderson is the son of Eric and Marion (Borman) Anderson. Marion was the daughter of Elmer and Beatrice (Bodine) Borman. I later corresponded with Mary (Johnson) Rhodes about the info on this page. Mary is Dorothy's daughter. She confirmed that it did take place at Butlers Park. She also said that her mother's list of who attended the reunion had a handwritten note on it saying that Mabel had typed it up. This is probably Mabel (Bodine) Snell, William Cramer Bodine's daughter. I think most of these people are related to Jacob Bodine (1806-1867) and his wife Catherine Fauss (1806-1884). And many, if not all, seem to be related to Jacob's son, John H. Bodine (1832-1904) and his wife Clara Sine (b. 1833). There is a possiblity that some of the guests could be related to Jacob's siblings (if he had any), but that is still unclear. If this can be shown, it might help determine who Jacob's parents were. We still don't have any pictures of this reunion, but we're hopeful one will show up. If you know of any, please do contact me. There are also people still living who attended this event. If you know of anyone, do contact us so that we can try to get more details about it. I have made a table below which includes the names from the list above. I have also included some comments about the probable or possible ancestry of some of the guests. My appreciation to Jeff Perine for the guest list and some information about it. Jeffrey William Perine is the son of Kenneth Arthur Perine, the son of Laura Bodine Hammond, the daughter of Elsie Mae Bodine, the daughter of William Cramer Bodine, the son of John H. Bodine (and Clarissa Sine), who was the son of Jacob Bodine and Catherine Fauss. And my appreciation to Bridget Bodine, the great-grandaughter of A.B.C. Bodine. She has called around and spoken to some of the surviving Bodine descendants who attended this event (or their family). This has been a great help in trying to clear up who was who. Earl B. Smith Hillside, NJ He was the son of Ann Sophia Bodine (John H. Bodine - Jacob Bodine).
" Lucy must be Earl's wife (or sister). Annie B. Smith Plainfield, NJ Annie could be Earl's sister. More likely is that she is Earl's mother, Sophia Ann Bodine, the sister of William Cramer Bodine. Joseph Morsley Trenton, NJ He is the husband of Emily J. Bodine, daughter of George and Anna (Parent) Bodine.
" She is the daughter of George and Anna (Parent) Bodine. Ringoes, NJ He is probably Lily's husband. Annie Bodine Flemington, NJ My best guess now is that this is Anna (Parent) Bodine, the wife of George L. Bodine. I'm not sure why she is listed before George Bodine below. I'm guessing George is her husband. Maybe George below is some son I don't know about.
" This is either George L. Bodine, the husband of the Annie above, or it is a son of George L. and Anna (Parent) Bodine who I don't know about.
" This must be the daughter of George L. and Anna (Parent) Bodine.
" Bridget Bodine says this is her grandfather. He was the son of A.B.C. Bodine. He was also a senator in New Jersey. She says he was born in Pittstown, New Jersey on January 22, 1899 and died in September of 1958.
" This is the husband of Keturah Braunworth Bodine (below). He was the grandson of Samuel Bodine and Jane Bird. His father was A.B.C. Bodine.
" This is, of course, the son of Clarence and Keturah Bodine. As of December 2000, Clarence Bodine, Jr. is still alive and living in Hunterdon County, New Jersey. Clarence is known as "Juni." " This must be William, the son of Clarence and Keturah.
" She is the Keturah (Braunworth) Bodine who died February 12, 1999 in Flemington, New Jersey. Her obituary was found in the "Trentonian," a newspaper from Trenton. Keturah was the first wife of Clarence Bodine, Sr. She was born about 1905. John R. Bodine Quakertown, NJ My guess now is that this is John Richard Bodine, the son of John M. Bodine. John Richard Bodine's wife died in 1930, maybe in childbirth.
" This is probably the son of John H. Bodine and Clara Sine. He would have been about 80 in 1930 so he came to the reunion with his son John Richard Bodine. They were from Quakertown. William Cramer Bodine would have been his brother.
" This must be Richard William Bodine, the son of John Richard Bodine. Richard was six years old at the time of this reunion. Charles F. Johnson Plainfield, NJ This must be the Charles Johnson who married Pauline F. Bodine, the daughter of John M. Bodine and Sarah Bloom.
" This is either Charles's wife, who I have listed as Pauline F. Bodine, or Charles's daughter, who I have as Eleanor Johnson. My guess is that it's Charles's daughter and that Pauline did not make it to the reunion. Harry B. Bodine Locktown, NJ This is Harry Bodine Bodine, the son of Henry and Mary (Horne) Bodine.
" This must be Harry B. Bodine's wife, Ellen (Godell) Bodine.
" This is Harry and Ellen's daughter.
" I wonder if this is Harry B. Bodine's mother. Or it could be a daughter of Harry's that I don't know about.
" I wonder if this is Ellen (Godell) Bodine's mother or sister.
" Karl is Elsie's husband.
" Goldson is Laura's husband. Lloyd H. Snell Dunellen, NJ Lloyd is Mabel's husband.
" Elmer is Beatrice's husband.
" Their child. She was still living as of February 2002.
" Their child. She passed away in 1998.
" This is probably William Cramer Bodine. He lived until 1961. He was going on 100 years when he died.
" Ray is Annie's husband. Allentown, NJ It looks like this is the son of William W. Bodine and Jerusha Ent. William was probably the son of David Bodine and Emily Lair and grandson of Jacob Bodine and Catherine Fauss.
" She must be Helen Polhemus, the wife of Frank S. Bodine.
" This should be Earle William Bodine. He was the son of Frank and Helen Bodine. W.W. Bodine Hamilton Square, NJ This must be William W. Bodine, the son of David Bodine and Emily Lair and the grandson of Jacob Bodine and Catherine Fauss.
" This must be Jerusha Ent, the wife of William W. Bodine.
" This must be the daughter of the Lawrence and Ethel Cribberly mentioned below.
" This must be Ethel Bodine, the daughter of William W. Bodine.
" I'm guessing this is Ethel's husband. Grover C. Bodine Flemington, NJ This is the Grover Bodine who married Agnes E. Hampton (sp.?). I think he must be the son of Joseph and Lillian Bodine. Joseph was the son of Samuel Bodine and Jane Bird.
" This would be Grover's son. As of December 2000, he was still alive and living in New Jersey. He is 85 years old. Agnes E. Bodine Flemington, NJ This is Grover Sr.'s wife. Her parents were Joseph and Sarah Hampton.
" Grover Bodine, Jr. said that his grandparents' names were Joseph and Lillian Bodine.
" I would guess that she is Joseph Bodine's wife. Marguerite Bodine New York City I would guess that she is Grover Bodine, Sr.'s sister. Grover Bodine, Jr. said that his father had a sister named Marguerite.
" He is associated with Marguerite Bodine. Emily Eick Simpson Three Bridges Emily is the daughter of Minnie West Bodine and Robert Holcombe Eick. Minnie is the daughter of David Bodine and Emily Lair.
" This is Emily's husband.
" Ruth is Clinton and Emily's daughter. Laura E. Goodell Locktown, NJ Laura is the daughter of Minnie West Bodine and Robert Holcombe Eick. Minnie is the daughter of David Bodine and Emily Lair.
" Richard is Laura's husband.
" My guess is that this is Laura and Richard's daughter.
" My guess is that this is Laura and Richard's son. Oscar C. Bodine Trenton, NJ This is the Oscar Bodine who married Annie E. Duffield. He was the son of Henry F. Bodine, the son of Jacob Bodine and Catherine Fauss.
" She is the adopted daughter of Oscar and Anne (Duffield) Bodine. Anne died in 1916.
" This is the wife of Victor Chamberlain Bodine, Oscar's son. Her maiden name was Charlotte Tye.
" This is the daughter of Victor Chamberlain and Charlotte Bodine.
" This is Dorothy Tye Bodine, the daughter of Victor Chamberlain and Charlotte (Tye) Bodine.
" This is the son of Victor Chamberlain and Charlotte Bodine. He later changed his name to Victor Charles Bodine. I have been in contact with his son Brian David Bodine. Victor Charles (or known here as Oscar Bodine, Jr.) was still living as of October 2003. Mr. & Mrs. A.B.C. Bodine Flemington, NJ This is Amplius (sp.?) Blake Chamberlin Bodine. His wife was Nellie Hoagland. He was the son of Samuel Bodine and Jane Bird. Carrie M. Stryker Frenchtown, NJ She must be related to the Theodore Stryker mentioned below.
" She must be related to the Theodore Stryker mentioned below.
" I believe a Theodore Stryker married Elizabeth Bodine, daughter of Samuel Bodine and Jane Bird. However, unless she went by some other name, I don't see Elizabeth mentioned here. Mr. & Mrs. Mercer Bodine Pittstown, NJ This is the son of Samuel Bodine and Jane Bird. His wife's name was Olive.
" I finally figured out who this couple is. It is W. Clifford Eichlin and his wife Marjorie Bodine, the daughter of Mercer and Olive Bodine, and the granddaughter of Samuel Bodine and Jane Bird. Mr. & Mrs. Samuel Lawshe Ringoes, NJ Mrs. Samuel Lawshe is probably Sarah Katherine Bodine, the daughter of John H. Bodine and Clara Sine, granddaughter of Jacob Bodine and Catherine Fauss. Sarah was William Cramer Bodine's sister. Eliz. R. Bodine Trenton, NJ She could be Mary Eliza Bodine, the sister of William Cramer Bodine, but that is just a wild guess.